Kenneth Hansen in action for Panthers earlier this season. Kenneth Hansen insists he is ready to roar back into Panthers action. The Danish star has missed the city club’s last four meetings while seeking medical help for a health issue. After undergoing tests and scans in his homeland, Hansen is now ready to slot back into the Panthers septet when they begin a busy spell of May meetings this Sunday when hosting Edinburgh (7pm). Hansen said: “I knew something wasn’t quite right in my body, and it had been like that for a while. “I have lost my mother and a cousin to cancer within the last 14 months, and that has an effect on you mentally. “It got to the point where I had to take some time out to get myself checked over and try to get to the bottom of it. “I’ve spent a lot of money - somewhere around £3,500 - but it was something I had to do. “The tests and scans showed up an infection in my prostate which has been the cause of the pains. “It could clear up in a couple of days, or it could take a lot longer, but it was just a case of needing to know. “Speedway is a dangerous sport - we all know that. My thoughts were starting to be on other things and that was affecting my focus. “It is not fair to my team-mates, my clubs, and supporters who pay their money to watch us race, to be in a position like that. And the lay-off doesn’t appear to have affected his form. 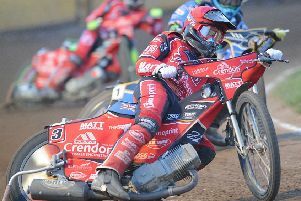 Hansen has competed in two meetings in Denmark in recent days - bagging nine points from five rides in an outing in the top-flight and then scorching to a maximum in a second-tier fixture. And he hopes to bring that sort of scoring power to the East of England Showground Arena & Events Centre as Panthers aim to build on an encouraging start to the season. They won five of their opening seven meetings of 2017 in all competitions, but have been out of action since a controversial SGB Championship defeat at Sheffield a fortnight ago. Hansen added: “I’ve tried to keep myself as fit as possible in the last few weeks and it was great to get back on the bike in a couple of meetings in Denmark. “I scored well in them and felt like I had a lot of speed, which really pleased me. “I’m just looking forward to riding at the Showground again. Everyone knows how much I love the place. It’s a great track and I love to put on a show for the supporters.